I confess to feeling a bit melancholy of late. 'Tis the Yule season, after all. Everywhere I walk in our bustling mill and factory town of Amesbury people are getting ready to celebrate the Christ's birthday. Surely no town in the Commonwealth of Massachusetts decorates in a more festive style than do we. Green garlands loop over windows. Red balls and bows adorn even the carriage traces. Ladies and girls sport green and red garments, with beribboned holiday hats and fancy dress slippers. White candles in windows light up the dark nights. So why do I profess unhappy sentiments? I am a teenaged Quaker mill girl with a secret longing for just a touch of frippery. How I would love to wear a lacy cuff on a stylish frock and a colored feather in a smartly trimmed hat. Even on normal days we dress plainly and soberly, and I am not allowed to play a part in the gaiety of the season. Our faith does not believe in celebrating Christmas as more special than any other day. Our plainly dressed Meetinghouse is lovely in the snow, it is true. But it does not hold an evergreen tree festooned with cranberries and gifts within. And so imagine my surprise when I awoke on the twenty-fifth of Twelfth Month, 1888, to find five packages wrapped in red paper and tied with curly green ribbon on our kitchen table. They were labeled with my sister's and my names and those of my three brothers. My aunt Rose, the midwife, who lives with us since my mother's death a year ago, stood at the stove stirring the cornmeal porridge with a tiny smile playing about her lips. "Rose, did thee..." I began to ask after I recovered from my surprise. Now beaming, she held up her hand. "I believe a man in red stopped by late last night." My mouth dropped open. "Santa Claus? But--"
She beckoned me closer. "Don't tell the younger ones," she whispered, but his middle name was David." I covered my mouth and giggled. Her handsome beau - not a Friend - was David Dodge of Newburyport. The twins, little Betsy, even eleven-year old Luke, all were charmed by their candy and gift, as was I. And we had a bit more holiday cheer, as it turned out, when David came in the large Dodge carriage that afternoon to fetch the entire family away for Christmas dinner. What was your biggest holiday surprise? Leave your answer with your email address in the comments and enter to win a signed copy of the first Quaker Midwife mystery, Delivering the Truth. Contest ends on Sunday, December 4th at 12pm EST. Contest open to all. Thanks! National bestselling author Edith Maxwell writes the Quaker Midwife Mysteries and the Local Foods Mysteries, the Country Store Mysteries and the Cozy Capers Mysteries (as Maddie Day), and award-winning, Agatha-nominated short crime fiction. 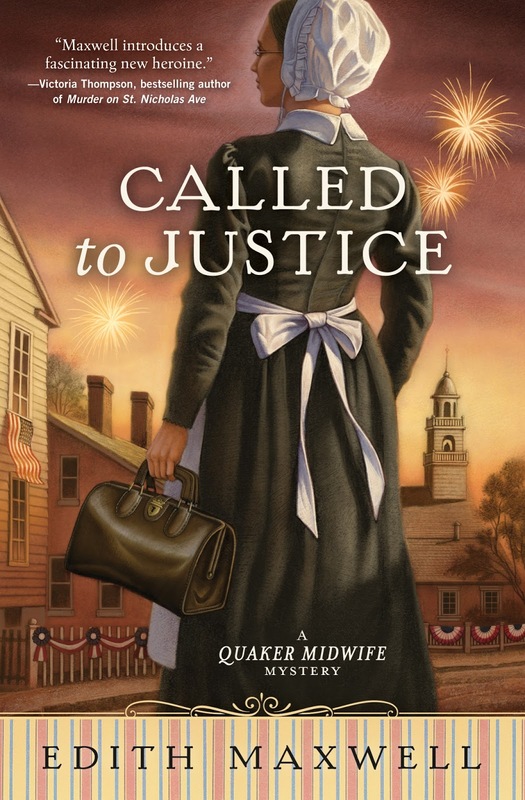 Called to Justice, Quaker Midwife Mystery #2, releases April 8, 2017! I love Faith's surprise, nice way to start the day! One of our best surprised for the kids was when my brother would show up late Christmas Eve after working the night shift and be here when his niece and nephew awoke in the morning. We'd all be exhausted but they loved it. A wonderful surprise was when my father came home from Viet Nam. Biggest surprise was the year my husband was on a remote assignment for the AF and managed to record all my favorite movies (Cary Grant especially and many other of my favorites) on VHS tapes. Perfect that he knows me so well. The big girl's bike I got when I was eight. It was a beautiful blue and went to fast. My biggest holiday surprise was my dad paying off my house many years ago. My biggest holiday surprise was getting a beautiful beagle puppy from my husband. You are the winner, Sue! Congrats. I'm sending you an email now. The biggest surprise I had at Christmas was the year my Dad surprised my Mom, my sister and me with pearl necklaces and earrings. The smile on his face was priceless. One year my Aunt and Uncle gave me a gigantic teddy bear. His name was Merry Christmas, Merry for short. I think my biggest Christmas surprise was the year I received the Fisher Price castle. It had a trap door that dropped unsuspecting people down to the dungeon. Lots of my Fisher Price people made that trip that Christmas! The worst surprise was the year when my mom went to get the meat in the oven only to discover it had gone bad. That was the year we had salad and mashed potatoes for Christmas dinner. Sigh. Santa (my parents) surprised my sisters & I with a pet bunny one year. Thanks for the chance. My biggest surprise was the year my husband had a necklace custom made for me. When we lived in a little cabin in the woods, Christmas was coming, and I wanted a tree. My husband surprised me with battery powered Christmas tree lights. Thank you so much for the contest. Christmas is always a happy time for me just all the lights,trees,and music...biggest surprise huge gorilla when I was four...I thought it was a monster in the dark..
Well, my engagement ring comes to mind, but then one year there was my bike with the banana seat and another was my skis with lessons. I have been blessed! Although I never got the Barbie I wanted...oh, well, you can't have everything. I was in college already, and Santa came to our house Christmas Eve as he always did. He left me a baby doll. Mother said later that Daddy just wasn't ready for his girls to grow up. The next year, Santa came for Mama and Daddy (my sister's idaa). Biggest surprise was finding Siamese kitten waiting in basket under tree. Silky was my first cat and still a delightful memory. It wasn't so much my biggest Christmas surprise, but what I gave my now husband, then boyfriend our second Christmas together. I found all the equipment for him to try his hand at home brewing beer at a neat shop that was both for home brewing and chimney sweeping. He opened up the big box and the look on his face was priceless. The absolutely perfect gift. I've been blessed in many ways. A year ago, it was confirmed that I have MS.A friend dropped by with a check to help with expenses. I was so touched.And it still feels like Christmas everytime I win a book. Thank you all you wonderful authors, while we may be doing good for your books, you help supply our days with wonderful reading. My first bike. It was something my dad cobbled out of parts he'd collected because there wasn't extra money for stuff. I had given up on having a bike. It wasn't pretty, but I had some great times with it. Sue Farrell, you are the randomly chosen winner! Please check your inbox. Congratulations. And thanks to you all for your wonderful comments about holiday surprises. I love them all. Mitten leggings and big, soft sweater.